Happy National S'mores Day! I'll be honest, before Whitney emailed me about this holiday, I had no idea that it even existed... which is a great shame! Luckily she educated me and this blog hop was born. I'm super excited to share one of my new favorite s'mores recipes with you today : frozen s'mores cups! It was actually really hard to narrow it down to which recipe I wanted to make and share because there are SO MANY good ones. 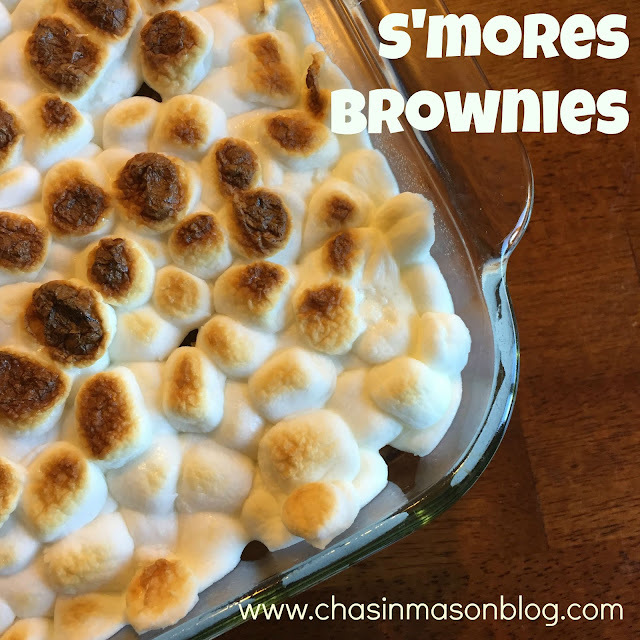 In fact, I've already shared one of my very favorite s'mores recipes EVER here (s'mores brownies!). I thought about sharing that recipe again because it is seriously THAT GOOD, but I decided to share something new instead. 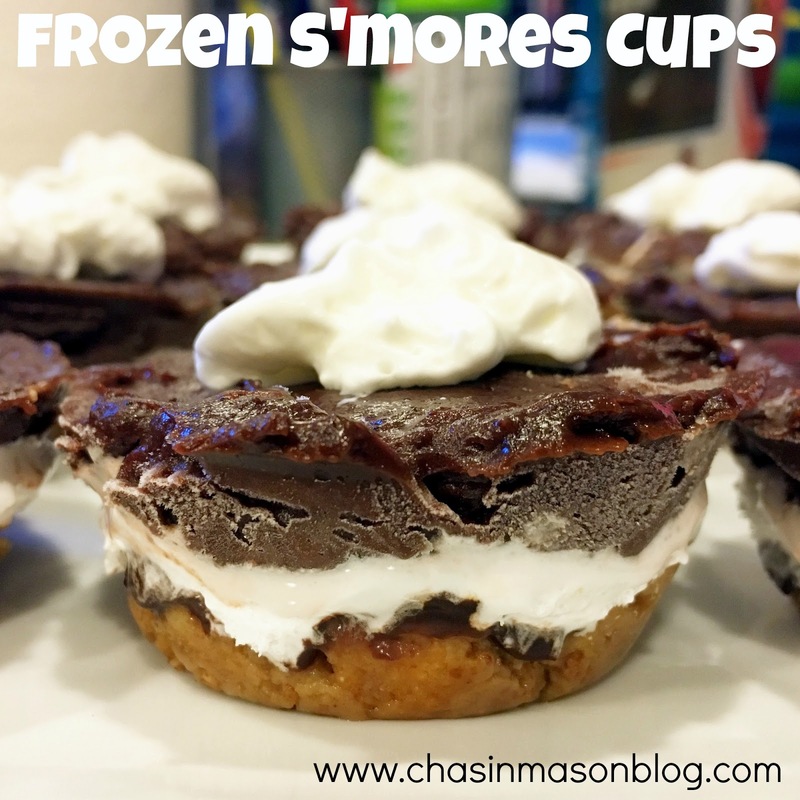 I searched and searched and searched Pinterest and I narrowed it down to s'mores cookie bars, s'mores cinnamon rolls, s'mores dip, and the frozen s'mores cups. The frozen s'mores cups ended up winning and I'd like to share that recipe with you today. 1. For crust, finely crush the graham crackers to make about 1 1/2 cups crumbs. Add the melted butter mix well. Set aside about 3 tablespoons for garnish. Press remaining crumbs into the bottoms and up the sides of 12 muffin cups. Place in the freezer. 2. Melt the 1/2 cup chocolate and the 1/4 cup cream in a glass bowl in the microwave, stirring every 30 seconds till smooth. Cool slightly, then divide between the 12 crusts. Freeze for 15-20 minutes or till set. 3. Spread about 1 tablespoon of marshmallow cream on top of each chocolate layer. Whisk together the milk and chocolate pudding mix till smooth; pour over the marshmallow creme. Freeze for 2-3 hours, or till firm. 4. Remove from freezer about 10 minutes before serving. Use the edge of a plastic knife to loosen the cups, then they should just pop out. If you need to, you can tip the pan sideways and run hot water over the bottom to loosen them. 5. Just before serving, whip the cream till soft peaks form. Add the vanilla and powdered sugar and continue beating till stiff peaks form. Pipe onto the frozen cups. Garnish with the reserved crumbs and chocolate chips. - I didn't make my own whip cream. I used store bought. - I completely forgot to add the graham cracker sprinkles on top before taking a picture. But don't make the same mistake! It really adds a lot to the flavor, so make sure you add them before you eat them! - I thought there could never be such a thing as too much marshmallow but... I think I might have put too much marshmallow. Mine didn't turn out nearly as pretty as the originals did, BUT they were delicious even though they were super messy. Now hop around and check out the other s'mores recipes! I know I will be! And if you need even more s'mores ideas (I mean, can you ever really have enough? ), check out my s'mores Pinterest board here! Ummm these looks and sound amazing. Not too difficult either. I need these in my belly. Yum! I love that it has all the s'more flavors but is a cold treat. So perfect for summer. These look so good! I love a good frozen treat! The marshmallow is my fave part! Load it up haha, I'm always a fan of tasty over pretty. Ooh such a fun twist on smores! You are brilliant!!! You know I love me an individual dessert...heaven right there!! Oh yum! Now I'm hungry!! Oh my goodness! I am loving this blog hop idea! My kids are huge s'mores fans! I can't wait to try this! YUM! These all look SO good! I've made something similar but I have to try these ! These look really good! I love this idea and all the recipes that you ladies shared! OH my goodness these look delicious! I think I need these in my life too! :) All of these yummy S'mores recipes, give them all to me! Lol about having too much marshmallow, I think the creme is actually thicker/sweeter so I know what you mean!! I want to make these like now! S'mores cinnamon rolls are to DIE for. My mom makes them and they are amazing. oh my lord! These look AMAZING!!!!! Have to try these! Whoa my mouth is watering! I want to try this so badly!!! LIZ! I want one - DOZEN! of these! They look so freaking amazing. Next time we plan a get together I'll only agree if you bring these with you! You guys are making me so hungry! These look amazing! Rewind [Five on] Friday // My Favorite Recipes. Four Year Blogiversary + a Giveaway! Back to School 2016 + a Link Up!